These boots and shoes are functional and fashionable. From left, Pendleton Heritage National Park Rain Boots, Xtratuf Salmon Sisters Legacy Boot. Walk a mile in these shoes—which are ready for anything a Northwest fall and winter might throw at you—while also keeping your footprint fashion-forward. We’ve paired each shoe or boot with a suggested adventure that will keep you on your toes. 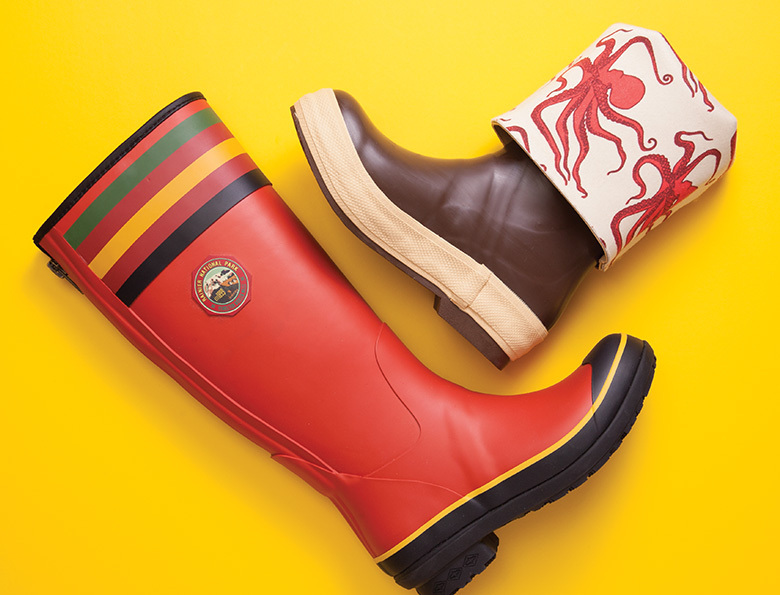 Your favorite Northwest blanket maker has produced a line of women’s rain boots to match its National Park collection—we all need a pair of the Mount Rainier style. The rare shoe, with comfy insole and underfoot support, lets you walk easily for hours. A back zippered gusset keeps the calf snug and comfortable. $150. Available at several area retailers, including Pendleton, downtown, 1313 Fourth Ave.; 206.682.4430; pendleton-usa.com. Suggested Adventure: Foster and Marsh Island Loop, Washington Park Arboretum. This is the perfect urban ramble; the boggy trail requires rain boots, but you’ll enjoy the company of ducks and other waterfowl as you walk under the State Route 520 bridge for a unique view of nature in the city. Suggested Adventure: A low-tide walk at Carkeek Park. Head to the beach during an ultra-low tide, which exposes up to 20 acres of seabed. The tide pools offer a glimpse of undersea life; check out sea stars, crabs and maybe even an octopus. Photograph by Hayley Young. From left, Merrell Siren Hex Q2 , Brooks Revel and Scarpa Crux. The hiking boot experts hit the jackpot with this all-around hiker for women. It’s lightweight and waterproof, with excellent ankle support and a nice contoured footbed. Put this one through its paces. $100. Available at several area retailers, including REI, downtown, 222 Yale Ave. N; 206.223.1944; rei.com and merrell.com. Suggested Adventure: Lodge Lake, Snoqualmie Pass. Take this 3-mile hike, with its gorgeous views of the pass, before snow begins to fall around Thanksgiving. Covering a small section of the Pacific Crest Trail, this starts from the Snoqualmie Pass ski area parking lot and goes through meadows bursting with fall color before descending through forest to the small lake. A great trip for families. Versatility is the hallmark of this Seattle-brand running shoe, available for men and women. Featuring a new circular knit upper and an internal bootie, it fits in the Brooks soft and protective “cushion” category. It’s at home on the road or the treadmill. $100. Available at Brooks Trailhead store, Fremont, 3400 Stone Way N; 206.858.5700; brooksrunning.com; and other area retailers. Suggested Adventure: Lake Union run. Take the Burke-Gilman Trail from Gas Works Park and begin by running west past Brooks headquarters in Fremont, over the Fremont Bridge and down to South Lake Union to the Museum of History and Industry (MOHAI) and back. Urban running doesn’t get any better. This is the Swiss Army knife of outdoor shoes. A great light hiker for men or women, but stylish enough for urban escapades, its colorful European styling sets it apart from dull workhorse hikers. The lacing goes right up to the toe for the best fit. The upper is made of suede and a breathable recycled polyester air mesh, and the Vibram sole is extra sticky for traction. $120. Available at several area retailers, including Evo, Fremont, 3500 Stone Way N; 206.973.4470; evo.com and scarpa.co. Suggested Adventure: Iron Horse State Park, North Bend. The John Wayne Pioneer Trail, which goes through the park, is more than 100 miles long and was once part of the Chicago, Milwaukee, St. Paul and Pacific Railroad. Several trails lead you to a view of the Upper Snoqualmie valley from the high trestles. Photograph by Hayley Young. From left, Icebug Diana Boot, Oboz Juniper Mid B-Dry Waterproof Boots. Winter is coming, snow queens. Whether you need a pair of après-ski boots or you’re looking for some serious time in the snow, check out this Swedish brand (its USA headquarters is in Bellingham). The Diana boots have styling for days and will keep you warm in temps as low as minus 4 degrees. $190. Available online only at icebug.com. Suggested Adventure: Gold Creek Pond Trail, Snoqualmie Pass. This trail offers an easy stroll on a paved loop before the first snowfall, or even a beginners’ snowshoe excursion once there’s a few inches on the ground. Easily accessible from the Sno-Park, it’s popular with sledders and cross-country skiers. This scrappy Montana brand is small with a huge and devoted following. This boot, designed specifically for women, sports tough, abrasion-resistant material, plus a waterproof membrane and a supersoft leather liner, making this a comfy ride for your feet, as well as a rugged one. It comes in two colors, but we happen to love the blue glacier. $145. Available at area REI, including Bellevue, 410 116th Ave. NE; 425.455.1938; rei.com and obozfootwear.com. Suggested Adventure: Granite Mountain, North Bend. Not for the fainthearted, Granite is a tough climb (a 3,800-foot elevation gain!) that makes you earn your views, but what a payoff. Autumn is best for this one, when colors are popping and you can still find some late-season huckleberries. The lookout tower on top is a treat, especially if a ranger is there (and there often is) to open it up for a look around. Photograph by Hayley Young. From left, IFrye John Addison Engineer Boot, Eddie Bauer Trace Boot, Filson Uplander Boot and Danner Vertigo. Frye boots last a lifetime. Your next investment should be the classic engineer boots, which can handle Seattle’s wet weather and get better with time. A pair of John Addisons, which Frye calls a “tribute to the great American working man,” will outlive your car and your mortgage—and, most certainly, skinny jeans. $488. Available at Frye, University Village, 2618 NE University Village St.; 206.487.5240; thefryecompany.com. Suggested Adventure: Ballard pub crawl. Be sure you include stops at classics Hattie’s Hat and King’s Hardware (how are your skee-ball skills?). Even sticking with brewpubs offers plenty of choices—just make sure you’re walking. End the night at Hale’s Ales and call a rideshare to get you home. Not all outdoor adventures are in the woods. We love when an outdoor brand takes its expertise into the lifestyle arena. These women’s boots are fully waterproof and will work as a staple for multiple seasons. Best of all, they also work in the office, for walking the dog and a stroll through the park on a rainy day. $180. Available at Eddie Bauer, multiple locations, including The Bellevue Collection, 133 Bellevue Way NE; 425.453.0450; eddiebauer.com. Suggested Adventure: Olympic Sculpture Park and Myrtle Edwards Park. Wander through the Sculpture Park, enjoying famous artwork with the best view of the Sound in town, then head over the bridge to Myrtle Edwards and walk along the waterfront. Bonus: Post-walk drinks and dinner are just blocks away. This boot is an updated version of one of Filson’s best-selling men’s hunting boots. The heavyweight, oil-tanned leather will soften with age and mold to your foot, while keeping it dry and warm. It’s ready for a long day in the woods or just a long day at the office on casual Friday. $375. Available at Filson, SoDo, 1741 First Ave. S; 206.622.3147; filson.com. Suggested Adventure: Nisqually National Wildlife Refuge, Olympia. While limited areas of this refuge are open for waterfowl hunting, probably the most popular activity is wildlife spotting and photography. Take a stroll through this pristine refuge; activities such as jogging and cycling aren’t allowed, but it’s a prime spot for capturing a diversity of birds, mink, beavers, deer, river otters and more through a lens. This beauty is a modern reboot (see what we did there?) of a classic hiker for men by Portland-based premium boot maker, Danner. For the Vertigo, Danner has swapped brown leather for black and modernized the signature stitch-down construction, while incorporating a comfortable Vibram SPE midsole and a cool pop of white—a color rarely seen in a boot—to demonstrate Seattle street cred. Waterproof and with Gore-Tex-lined full-grain leather, this boot will stand up to the weather for miles. $220. Available at the Danner store in Renton, 829 N 10th St., Suite A; 425.226.6338; danner.com. Suggested Adventure: These are perfect urban ramblers, so we suggest a Seattle stair climb. The Queen Anne loop might be the best: 4 miles of up and down, 830 steps up, 994 down. Start and finish at Kerry Park, then head to a watering hole on Queen Anne for your reward.